The best time to enter a market is when trapped traders realize that they are wrong. As they get out and reverse their positions, they push the market in your favor. This phenomenon offers you an advantage in timing your market entry. An example is the Hikkake pattern. 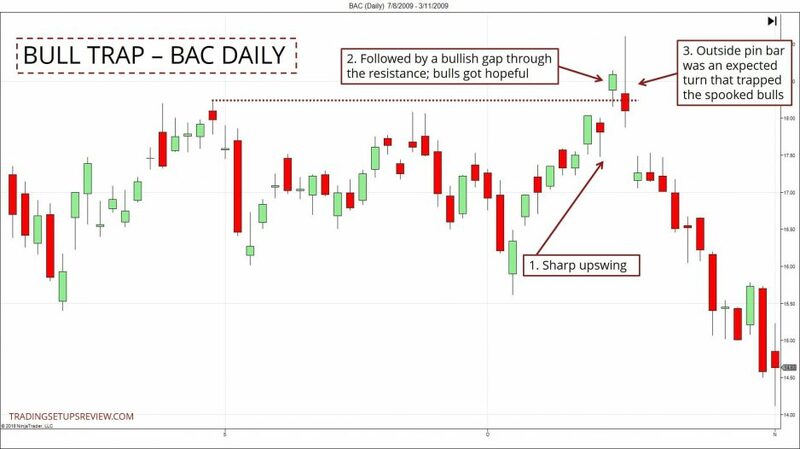 In a bull trap scenario, the market breaks out above an inside bar to lure bullish traders in, before falling again. As the market falls, the bullish traders are forced to exit their positions. You can then exploit the market flow created by these exiting traders by going short. How do you find these trapped traders? Trapped traders is a trading concept that can manifest in various forms. It is not a single price pattern. Hence, there are no fixed rules for identifying them. This rush should get the traders excited. It should make them hopeful that the market will break the support or resistance level. Here, you want to see the hopes of the abovementioned traders crushed. You want to have them trapped. Swift and repeated rejections from the support or resistance level is ideal. Let’s look at three examples below. 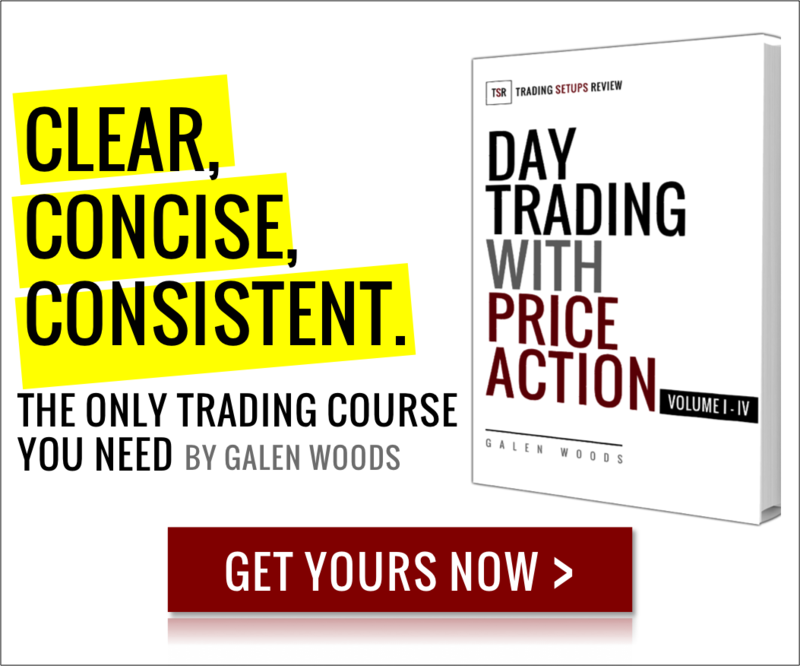 They will shed light on how to apply these guidelines in real-time trading. The focus here is to point out pockets of trapped traders, and not on exact trading setups. The bearish outside bar had little follow-through. Not only that, a bullish outside bar took over quickly. Such price action emboldened the bullish traders. However, the rising market did not pass the real test. When it tried to rise above the resistance zone, it was rejected as you can see from the pin bar. The bulls were trapped. In this extended example, we will discuss the price action at two support levels. This bearish bar was dominant and prompted fear of missing out among bearish traders. The bears were lured in. However, examine this area, and you’ll find that the bears had many reasons to feel jittery. There were several bullish signs: a bullish inside bar, failures to close below the support, a wide range bullish pin bar, and a bullish reversal bar. Streaks of bearish bars gave hope to the bears again. 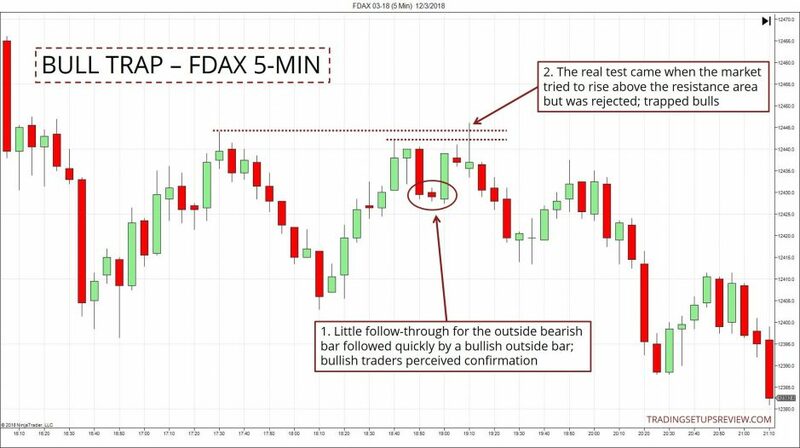 The third arrow from this box pointed to a bearish outside bar that drew in bearish traders. There were clear signs of hopeful bears. However, attempts to go below the support level was repelled. These repeated quick failures confirmed that the bearish traders were trapped. Notice how the observations correspond to the stated guidelines. Point 1 and 3 above pointed out the price action that made the bears hopeful and led them into the market. 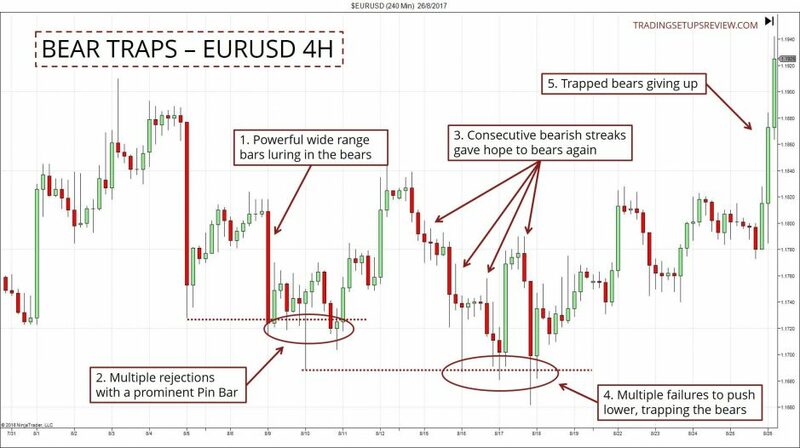 Point 2 and 4 pointed out the price action that disappointed the bears and revealed the trap. This sharp upswing attracted the attention of the bulls. This bullish gap bar showed that the bulls have tipped their hands. However, the market immediately rejected the attempt to make a new high. This climactic bearish outside bar/pin bar was a clear sign of trapped bulls. Time to short. In the examples above, you saw how you could follow simple guidelines to find trapped traders. At the same time, you saw how different the scenarios could be. Hence, this method of reading the market requires much practice. Do not think about when to enter the market. That will make you anxious and unprofitable. Instead, think about when other traders would enter. And think about when they would become anxious. Put yourself in their shoes. Then, enter the market as it moves against them. In a nutshell, once you locate trapped traders, you have a sound premise for entering the market. Fantastic article. Thanks for sharing!